The ASC-Filter range from DM Engg, works based on Bernoulli’s principle. ASC filters are equipped with a timer circuit and a differential pressure switch. The filter continues it’s operation until a pre-set timer value is reached or a differential pressure value is reached. The filter enters into cleaning mode on trigger by any of these two inputs. On receiving signal the control panel opens the auto drain valve. Bigger particles of dirt & impurities are washed out of filter housing though drain valve due to incoming flow pressure. after short interval, a pneumatically driven piston fitted with a sweeping disk, in a closed filter chamber, is moved up and down. This action creates low pressure, high velocity and high pressure, low velocity zones near filter screen walls. As a result of this, flow reversal takes place dislodging the clogged impurities from the filter screens. Once the piston completes cleaning cycle the drain valve is automatically closed and filter resumes next cycle. The USP of DM engg’s ASC filter is it continues to filter inlet stream while the cleaning is in progress. Salient features of ASC filters form DM Engg. The filter vessel can be produced in stainless steel, carbon steel (with or without inner lining) or glass fiber reinforced plastic. The filter insert can be supplied made of stainless steel, titanium or Super Duplex materials, PP. Other material can be supplied upon request. D M Engineering Co. successfully executes major Export order for TEDAGUA SPAIN; its first from an European Buyer. D M Engineering Co. successfully executes major export order for design, manufacture & supply of PP + FRP sea water intake basket strainers for TEDAGUA, SPAIN, its first from an European buyer. TEDGUA in consortium with HSL, Singapore chose DM engineering for supply of 6nos of 490 m3/hr Sea water intake basket strainer for their Desaliantion project of Public Utility Board (PUB) being constructed at TUAS, Singapore. DM engg suggested CNC router drilled 2000 micron PP screen housed inside PP + FRP Body, making it a perfect & cost effective combination for harsh services like Sea water. The housings were design for PN10 rating and tested at 13 bar pressure at DM Engineering’s factory; in Vasai, Maharashtra. The cost of such Non metallic FRP strainers is 1/5th of duplex steel Stariners and is ideal substitute to traditional metallic ones for such applications”, said Mr. Parag D Patil, CEO of D M Engineering Co.
About D. M. Engineering Co.
D. M. Engineering Co. is a leading Engineering Company engaged in to design and manufacture of FRP/GRP Equipments for Water, Deslination plants, Refineries, Steel plants, Power plants etc. FRP suction strainers (Y/T/ Basket type) for sea water intake for flow rates up to 1200 m3/ hr. “D M Engineering Co. bags 3rd repeat order for Design and Site Fabrication of 165KL HCL storage tank from IOCL, Barauni Reifnery, Bihar”. D M Engineering Co. bags 3rd repeat order for design, site fabrication and erection of 165 KL HCL storage tank at IOCL, barauni Refinery, Bihar. Owing to the huge size 6 mtr dia X 6 mtr ht DM engg had proposed to make tank at refinery site thus saving huge transportation cost and transit hazards. The tank will be made in strict compliance with EN13121. Prior to this DM engg has executed similar order in 2008 & 2012. 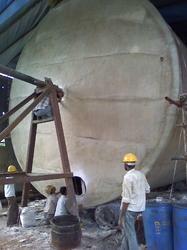 With this tank order, the total HCL stored in DM engg made tanks at IOCL, Barauni site will be 495KL. DM engg received special appreciation certificate for its quality and timely order execution from then EIC. “PP + FRP Dual laminate tank is an ideal choice for storing highly corrosive Hydrochloric Acid and is perfect replacement for MSRL tank”, said Mr. Parag D Patil, CEO of D M Engineering Co.
D. M. Engineering Co. is a leading Engineering Company engaged in to design and manufacture of FRP/GRP Equipments for Water, Desalination plants, Refineries, Steel plants, Power plants etc.